The La Pacana caldera is one of the largest calderas on earth and has been the source of two major ignimbrites in the past 5.5 My. 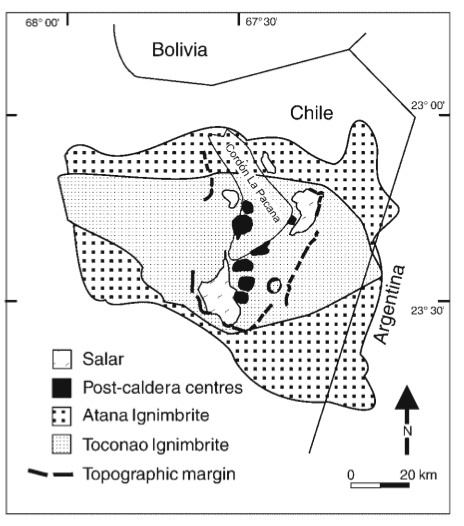 The first activity at La Pacana was the eruption of the ~5 My Toconao ignimbrite, followed the eruption of the caldera-forming Atana ignimbrite (Lindsay et al., 2001). Following the emplacement of the ignimbrites, continuing volcanic activity created a large resurgent dome . Activity continued until ~1.6 My, producing a series of silicic domes on the margin of the resurgent block , and within the caldera moat. The silicic domes are crystal-rich dacites, and are similar to the Atana ignimbrite in composition. The silicic domes likely represent degassed Atana magma (Lindsay et al., 2001). Figures from Lindsay et al. (2001). The Toconao a crystal-poor rhyolitic ignimbrite with an estimated volume of ~180 Km3. The ignimbrite can be sub-divided into two facies, a lower non-welded and non-indutrated facies containing abundant tube pumice , and an upper phase that is clearly indurated. See stop 22 for more details. The Atana ignimbrite crystal-rich dacite that occur as both outflow and intracaldera fill and has a total volume of ~2500 Km3. The Atana ignimbrite is typically welded and show various degrees of devitrification. 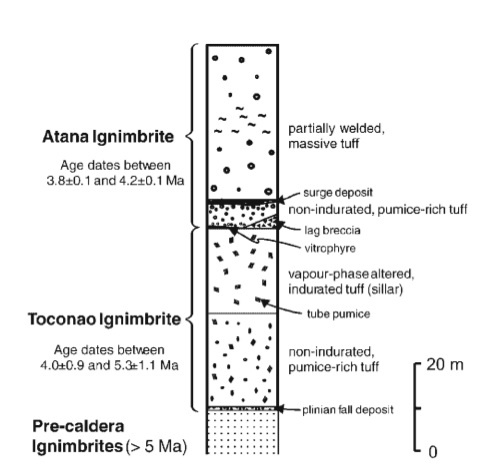 The Atana outflow is typically ~30-40 m thicks and sits atop pyroclastic surge and soft ash deposits. See stops 31 and 33 for more details.